In the third and final video in the series "Kitchen Remodeling Advice for Family & Friends," Homeowners Design Center's Sales Manager Randall Omoto talks about "The Big Secret!" This video discusses how a homeowner can get the kitchen that they've always dreamed of by keeping the cost of the remodel on budget. Omoto explains this by literally illustrating how it's done. "Your (kitchen remodeling) costs are... broken down into two separate categories or sections," explains Omoto in the video. They are your construction costs (fixed costs) and your finish costs (variable costs). Finish costs will include the costs of your cabinets, the sink, appliances, lighting, etc. Randall Omoto, Sales Manager of Homeowners Design Center, uses a diagram to illustrate how homeowners can control the cost of their kitchen remodel. Omoto warns not to go cheap with the kitchen cabinets and the sink because countertops, a lifetime product, will be placed on top of them. "(If) the cabinets fail and if the countertops cannot (come) off in one piece... we'll have to excavate, or destroy, the countertop just to get to the cabinets... and now we're doing the whole project all over again." The same situation applies with choosing a cheap sink. The construction costs normally only change when you change the scope of work, says Omoto. "You were thinking about doing two bathrooms and a kitchen..." and because of what that's going to cost, you now need to change that scope of work to fall back within your budget. When you finally determine what your finish and construction costs for your kitchen remodel are going to be, you'll have your "total cost." At this point, hopefully you'll find that your budget is greater than your total cost and not the other way around. Click on the image below to watch "Kitchen Remodeling Advice for Family & Friends - The Big Secret!". 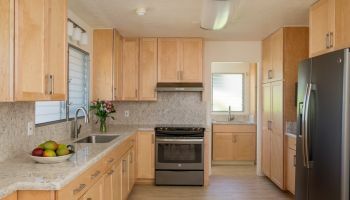 In his explanation, Omoto divides the finish and construction costs in half to illustrate the secret in controlling the costs of your kitchen remodel. Having these costs "bundled" as one entire cost limits your flexibility in choosing your finishes, thus putting you into a situation where you leave the finish choices up to the design/ build firm. In such a case, sacrifices in the quality of the finishes can be made so that your remodel stays within budget. To avoid such a situation in your kitchen remodel, Omoto advises to remember two terms. "The first is 'By owner'... (where you're) in charge of whatever you want to be installed, (for) example cabinets by owner, countertops by owner..." The second term is "No allowances." "Allowances... help you get a general idea of... the cost of the whole project," says Omoto. The problem is that the homeowner can get stuck with settling for the allowance that was set for the finishes. "So you get a really fabulous house but you get really junk finishes... because the allowances weren't set high enough," cautions Omoto. To see video 1, "Establishing the Objective," or video 2, "Selecting the Expert Adviser," just click on the individual title. 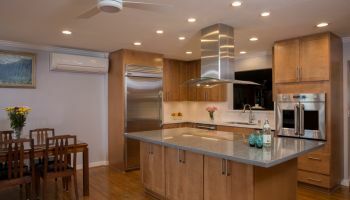 To hear more tips and advice from Homeowners Design Center on how to plan for your kitchen remodel, click on the company name wherever you see it.